Entertaining Elliot: Love Where I Live - A new linky! I've been toying with the idea of starting my own linky for a while now but couldn't decide on the theme. Tonight I wanted to write a post about how beautiful some of the scenery is here in Dorset but out of all the linkies in my list (and there are lots! See here for Aby's amazing list), there wasn't one that I felt suitable for my post. As it was, the post never got finished and is sitting in my drafts but it got me thinking! 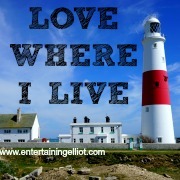 Love Where I Live is brand new linky where you can shout about all the things you love about where you live. Maybe you have some stunning photography you want to share, or maybe you want to tell the world about a fun local day out you recently visited. Maybe you've got a favourite cafe, or a favourite shop you want to blog about. Anything goes really, as long as it's about where you live! I am looking forward to learning more about where you all live - and I'm sure it will give me some more ideas of where to visit! The linky will go live each Thursday and you'll be able to link up as many posts as you like, old or new. Please share this, tell your friends and spread the word - hoping to have lots of lovely blogs to read!